Firstly lets discuss what Paintless Dent Removal ( PDR ) is. Paintless dent removal is the process for removing dents, dings, creases and hail damage from vehicle body panels when the paint isn’t broken. 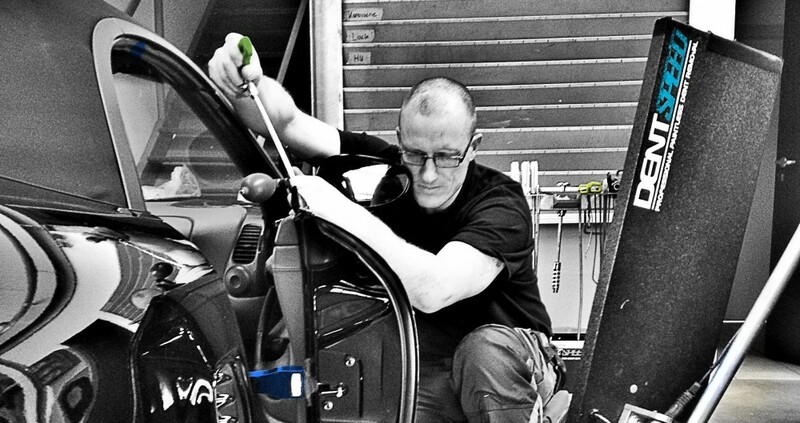 An experienced technician uses specially made precision tools to push, pull, tap and blend dents out from vehicle panel-work keeping the paint intact. It takes years for the technician to become competent and to be able to operate at a high level. Speed – dents can be removed in hours or minutes rather than days and weeks compared to traditional bodyshop methods. Non Invasive – Paintless Dent repair is considered a clean repair method as no paint, fillers or chemicals are used. Also there is no need for grinding, welding, sanding or cutting away of panels. Originality – By this we mean your cars factory paint is maintained because no painting is employed. Superiority – PDR is the preferred repair system and is superior to other repair methods for your car when applicable. It is the closest thing to your car retaining its originality and therefore value after a repair. Of course we understand there is a place for traditional body shops and we actively work alongside them to ensure customers get the right service for them and their car. We are not trying to dismiss their repairs or methods they use, but it is important to understand there is an alternative, that when applicable is a higher quality repair when performed by a skilled and experienced technician. Consider this, both insurance companies and body shops utilise PDR, so what does that tell you? Of course having said all this it’s important you do your research when choosing your Paintless Dent Removal company. Good reviews and customer feedback are the best place to start.